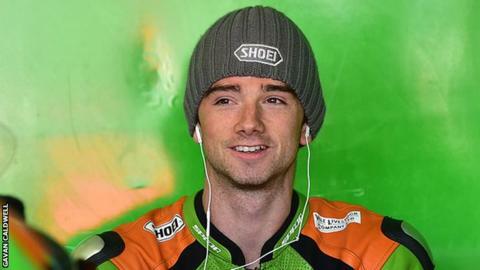 Northern Ireland's Glenn Irwin took his second British Supersport victory of the season by winning the feature race at Cadwell Park on Monday. The Carrickfergus rider won from series leader Billy McConnell to move up to fourth in the championship standings. Alastair Seeley lies third overall after ending sixth in Sunday's sprint race and failing to finish on Monday. Andy Reid won the Superstock 600 race and Marty Nutt the Ducati Cup event to make it three wins for NI competitors. Irwin, 25, mastered the difficult wet conditions best to take the chequered flag after finishing fourth in Sunday's race. "I pushed really hard at the start and the Gearlink Kawasaki has such a good set-up in the wet and the dry. "I built up a bit of a lead and decided to slow down a bit near the end, only to find that my lap times got faster." McConnell leads the series on 272 points, followed by Graeme Gowland on 264, Seeley on 234 and Irwin on 196. FFX Yamaha pilot Reid halved his deficit at the top of the Superstock 600 series and he now trails championship leader Kyle Ryde by 12 points. Nutt, from Castlerock, is third in his class after battling his way to the front to secure success on the wet County Lincolnshire track. Tommy Bridewell and road racing sensation Peter Hickman clinched their maiden British Superbike wins at the meeting.